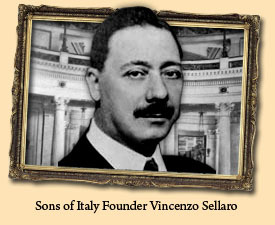 Originally called "L'Ordine Figli d'Italia," the Order Sons of Italy in America was established in the Little Italy neighborhood of New York City on June 22, 1905, by Vincenzo Sellaro, M.D., and five other Italian immigrants who came to the United States during the great Italian migration (1880-1923). Their aim was to create a support system for all Italian immigrants that would assist them with becoming U.S. citizens, provide health/death benefits and educational opportunities and offer assistance with assimilation in America. In its early years, OSIA established free schools to teach immigrants English and centers to help them become U.S. citizens. The first OSIA lodges established orphanages and homes for the elderly, life insurance and mortuary funds, credit unions, welfare societies and scholarship funds to aid members in need. During World Wars I and II, OSIA members bought war bonds and war stamps to support the war effort, and lodges competed with each other to contribute the most money to the Red Cross. In World War II, the OSIA Supreme Council (national officers) issued a resolution urging members to donate one day's salary to the national defense. To date, OSIA members have given more than $93 million to educational programs, disaster relief, cultural advancement and medical research. Organizes grassroots efforts to support legislation and other issues of importance to Italian Americans.